A while back, I asked you all on Facebook, Twitter, and Instagram if you had any questions for the experts at Paracord Planet. It was fun seeing your questions and here are our responses! For those of you who do not know, the inner strands of paracord are often removed for projects so that the cord can lay flat in a weave or knot. While we have no certain plans to sell coreless or peach colored paracord at the moment, you are always more than welcome to leave us a suggestion on our website! We have a special section for you to leave your comments and feedback. Head on over to the New Product Request section on our website and you may see your suggestion come to life in the future! We also post many other tutorials over on our YouTube channel, so be sure to subscribe and check out all our videos. Great question, Chris! This question stumped many of our staff members! The survival grenades that we sell (pictured below) do not have a sheath around the survival items, they just lay flat in the weave of the grenade. We came up with a few suggestions for a sheath to wrap items in if you want to make your survival grenade into a certain shape: plastic Easter eggs or tin foil. The plastic eggs will give you a round shape to wrap a monkey fist on and the in foil is easily reusable in a survival situation. Great question! Our typical rule of thumb is to use one foot of cord per inch on your wrist. For example, if you have a wrist that is 8 inches around, you will need 8 feet of cord for your bracelet. Check out our video below on how to properly measure your wrist for a bracelet! 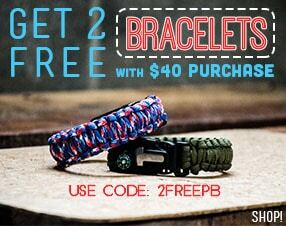 It can be difficult to keep a large inventory of paracord neat and tangle free. However, we have an entire blog dedicated to this topic! 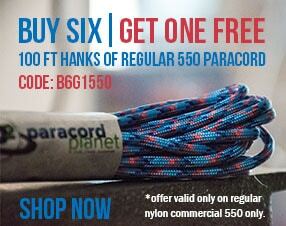 Click the image below to learn 5 ways to store and organize your paracord! Looking for more resources about paracord? Be sure to check out the Paracorner section on our website for tons of information on cord types, sizes, and more! Follow us on: a: Facebook, Twitter, Instagram, Pinterest, Youtube, and Google+!